The industry's first and only truly universal and modular inspection system -- Inspection Arsenal® -- adds even more versatility with the all new Skinny-Vise™. The new vise improves visibility, and repeatability on your CMM and Vision Systems. With the gentle twist of the thumb screw, inspectors can easily hold small, thin and odd parts with simplicity and precise repeatability. "Expose more of the part and keep the clamp as non-intrusive as possible," explains Victor Rinaldi, Product Engineer at Phillips Precision. "With the Skinny-Vise™, you can easily see past the fixture on vision systems and CMM probes can easily access nearly 100 percent of the surface of a part." The static jaw is adjustable up to 1.25", while the locking jaw is easily engaged with just a quick, gentile twist, allowing for incredibly fast swaps and repeat inspection of very thin, small parts. 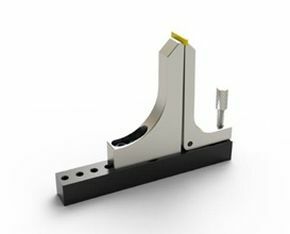 Soft aluminum jaws can be customized to hold parts of all shapes including pins and spheres and the vise base can be mounted in any direction desired, giving inspectors even more options to hold parts more efficiently than ever before. Modular inspection with Inspection Arsenal® offers a LEAN solution to break bottlenecks that plague inspection labs everywhere. Manufacturers can build fixtures just once and add them to the job box, quickly swap between unlimited fixtures on one machine or use one fixture across unlimited machines.